Key reference tools for remedying the misunderstood word and building a strong vocabulary. 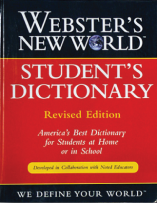 Applied Scholastics recommends Webster’s New World Dictionaries for students at all levels of education. Includes new words, illustrations, photographs, maps and thesaurus.